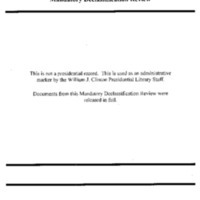 This Mandatory Declassification Review contains material on Kosovo from 1999 from the National Security Council's Records Management System. Materials include two memoranda from Richard Holbrooke, one regarding Slobodan Milosevic and the other regarding options for our next steps in Kosovo. Also included is a paper on Kosovo diplomatic strategy.